385diggsdigg Not interested in waiting until the 23rd for Verizon's big announcement? Don't worry, we've got you covered right now! The Motorola Droid X has probably been one of the worst kept smartphone secrets in recent memory, but after spending two hours with the phone we sort of see why. In short, it's pretty awesome. Call it a superphone or a mega-smartphone, but the 4.3-inch handset is absolutely Verizon / Motorola's answer to the HTC EVO 4G, and makes the Droid Incredible look like a bench warmer. What do we mean? We'll let you see for yourself just after the break in a breakdown of exactly what this phone is all about -- and in a video or three of it in action. Oh, and on your way down, make sure to feast your eyes on the gallery, too. Hardware: From afar, the Droid X looks like the EVO 4G, but up close the differences are obvious. Its slightly longer and wider, and it has four physical buttons along the bottom of the screen rather than touch-sensitive ones like those on the EVO. In hand, the phone feels really solid and we were surprised at how light it felt, though we could really do without the hump on the back. And yes, the large thing fits in a jean pocket, but not without slightly bulging. Screen: Apparently the Droid X has a 4.3-inch, FWVGA 854 x 480-resolution screen, though we couldn't confirm that on the device itself. Regardless, it was super crisp and the capacitive screen was mighty responsive to taps and multitouch gestures. Our one concern is the mirrored trim around the screen -- it makes the whole face of the phone extra glossy. Motorola Blur / Android: We confirmed that the Droid X was running Android 2.1 with some new sort of Motoblur (perhaps Ninjablur) skin. We didn't get to configure Blur with our social networks and contacts, but it didn't seem as "in your face" as the original. There's also a new navigation bar along the bottom that lets you easily jump to different Android panes. We can't really make a call on how we feel about this new Moto skin, but it does feel like a major improvement and it absolutely didn't slow down performance. We should also mention that preloaded on the phone was a Blockbuster application and a DLNA type app. Those two pieces combined with the fact that there will be a separate HDMI dock available has us thinking multimedia is the focus here. Camera / Camcorder: The Droid X has a 8-megapixel camera, and records 720p video. But here's the thing about the camera: you have to tap to focus and it doesn't refocus until you actually snap the picture. In addition, the camera button on the phone was super stiff, so when we went to shoot a pic the entire thing shook and blurred the image. You can see what we are talking about in the gallery below. As for video recording, it was a bit laggy while we were shooting at 720p, but the video plays back smoothly, and in our opinion, crisper than the EVO 4G. Nevertheless, as you can see in the clip below, the white balance keeps on changing and the exposure fluctuates. Keyboard: Just like with the CLIQ XT, Motorola preloads Swype. However, we also noticed a "multitouch keyboard" option. Oh yes, you heard us. When we held down two letters simultaneously it recognized both. We could really go on and on about how excited we are about this, but just check the video below of it in action. Performance: Snappy! That's exactly what the Droid X is. The entire phone and transitions were super fast and responsive, keyboards popped up with virtually no lag and it tracks finger swiping more accurately than most Android phones we've seen -- it undoubtedly has its 1GHz ARMv7 processor (presumably an OMAP3630) to thank for that. If the specs on the model we saw are correct, the phone will come with 8GB of storage space. Obviously, we didn't have enough time to test battery life, but there was some sort of special battery management software on the phone. Pretty promising, isn't it? We should know more when we get an announcement toward the end of the month, but in the mean time, we're really excited about what Moto's got going on here. 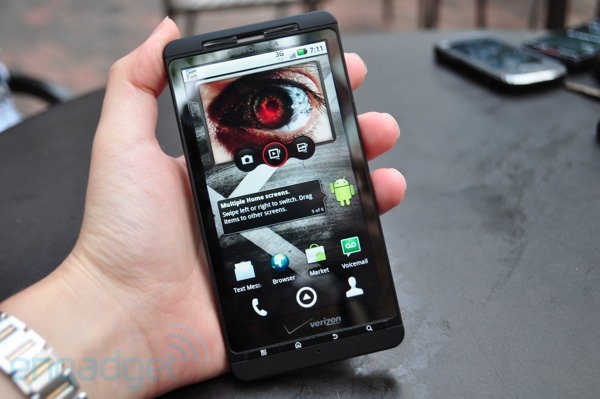 Updated: There have been conflicting reports on the Droid X's screen size. We're going with 4.3-inches for now. Sam Sheffer contributed to this article.